Working at a nonprofit means wearing many hats — and there’s a lot of content out there to support it all. However, it can sometimes be hard to figure out where to look for different topics. Sometimes you need to learn something specific, like how to create nonprofit videos on a shoestring budget. Other times, you might want to learn more about the state of the nonprofit sector as a whole, like this piece about why 2019 is the year for nonprofits to innovate. And finally, sometimes you just need a fun read — like this piece on how to tell you work for a nonprofit. However, when you’re already busy with other tasks, sorting through all the content out there can feel a bit overwhelming. 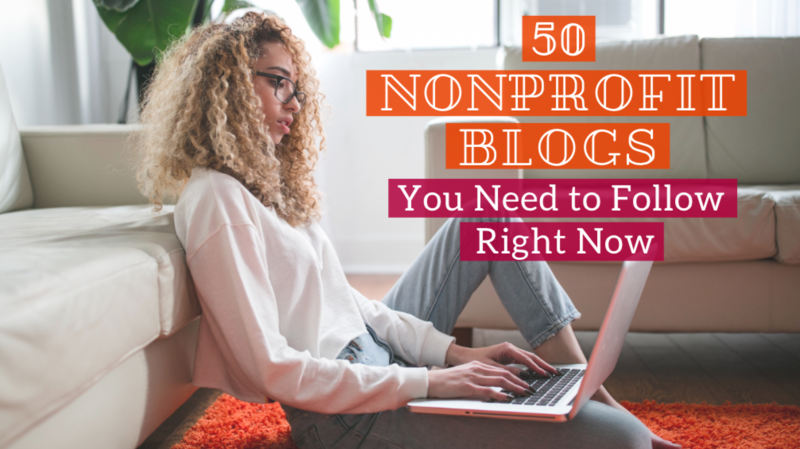 That’s why I created this alphabetical list of all the nonprofit blogs you need to follow. I’ve added a quick description of each blog so you know what kind of content to expect from it, and I’m hoping you can find a few new blogs to follow and bookmark the next time you’re looking for a good read. Run by Julia Campbell, nonprofit social media and marketing expert, this blog is a must-read for anyone working in nonprofit communications or marketing. She covers topics related to digital marketing, social media and strategic planning for nonprofits of every size. Beth's blog is run by Beth Kanter, a nonprofit expert with over 30 years of experience in nonprofit technology, training, capacity building, evaluation, fundraising, and marketing. Her blog focuses on helping nonprofits use their social media channels to boost donations, attendees, and engagement. Big Duck strives to help nonprofits improve communication with their donors, audience and potential members. Their blog is strictly used for insights on communication strategies and also features e-books, podcasts and videos. Bloomerang is a helpful tool for nonprofits needing to manage member engagement, mailing, donations, and other basic functions. Their blog contains a wide range of content for nonprofits from donation advice to marketing strategies. It’s also a great source of recurring content for the one-person-show nonprofit. Charity Navigator is one of the largest independent charity evaluators and leading donor advocates. Their blog shares thoughts on emerging nonprofit sector issues and offers tips to make better giving decisions. While they focus primarily on donations, their blog still covers topics such as new laws, philanthropy, and general nonprofit advice. Their blog also features premium paid content like e-books and online training. On the CharityVillage blog, you can find free resources to help guide your personal career in the nonprofit sector along with industry news and information. Their site also allows you to post or search through nonprofit jobs and provides helpful content to assist with your human resources search. Classy is a social enterprise that creates world-class online fundraising software for nonprofits. Their blog focuses heavily on fundraising strategies and advice as well as offering similar content in podcast, infographic, roundup and video format. Elevation provides web services for nonprofits — from graphic design to copywriting to website design — and the content of their blog reflects that as well, covering topics such as digital marketing, UX and social media. Foundation Group is a leader in nonprofit formation, tax, and compliance services helping nonprofits anticipate and avoid problems at both the Federal and state level (specifically 501(C)(3) nonprofits). Most content covers legal topics, traps and issues with in-depth descriptions and advice. Get Fully Funded tries to help nonprofits understand all aspects of receiving and managing funding. Their blog reflects their mission by publishing easy-to-read content with lots of industry insights on fundraising strategies, grants, and financial management. Not sure which blog to search for a niche topic in? GuideStar is the largest, most frequent content producer in the nonprofit space. Their goal is to help nonprofits better understand the importance of data in decision-making through educational content. This blog features over 250 nonprofit categories and growing, with content covering most nonprofits’ niches. Hands on Fundraising is dedicated to helping nonprofits raise money for their cause through consulting and educational content. Their blog features expert advice on every aspect of fundraising and is written in a friendly, easy-to-read style. Hypsypops ties together branding and data collection for do-it-yourself nonprofit leaders. The site is operated by Andrea Robertson, a scientist and branding expert passionate about helping nonprofits. Her blog covers all essential categories for nonprofits to create or build on their existing branding, and present useful data using digital design. Idealware is an authoritative source for independent and thoroughly researched technology resources for the social sector. Through publications, assessments, and training, they help organizations make the best management decisions possible. Their blog focuses on thought leadership and nonprofit decision-making. If your nonprofit needs marketing advice, this is the place to find it! John Haydon, a nonprofit marketing expert, runs the site and offers his professional advice in coaching sessions and blog format. Learn new marketing strategies or improve your current ones through social media, advertisement, and search engine optimization advice. If you're just starting your marketing strategy, John also offers courses which are great for building your knowledge foundation. Looking to find more members, or engage the ones you already have? Joy Duling’s blog focuses on growing your membership and creating a more engaging experience for everyone involved with your organization. M+R is an active platform advocating for social change around the world. Their blog follows a scientific nonprofit style with lots of technical content for campaigning, as well as in-depth descriptions of personal improvement techniques. Media Cause helps nonprofits grow and create more impact through digital marketing. Their blog covers digital strategies for social good, with content focused on fundraising, advocacy, advertising, branding, and more. Each post is filled with advice helpful to nonprofits of any size. Mobile Cause is a mobile donation platform heavily focusing on providing value to users through downloadable content. Their blog doesn’t have many posts, but each is rich in quality content and reads for 10 minutes plus. Their large selection of downloadable content aims to help charities with fundraising and narrows down strategies by niche such as digital fundraising, crowdfunding, and more. Network for Good focuses on giving nonprofits the advice they need to grow their marketing strategy. Their blog is split into categories such as "best practices", "marketing" and "fundraising", allowing you to filter content by "topics" and "resource types" to narrow down your search. Nonprofit AF is the gold standard of nonprofit blogs. It’s run by Vu Le, an experienced keynote speaker and nonprofit leader who talks about a variety of subjects with the goal of improving organization function. His blog covers a variety of topics such as fundraising, board management, financial decision making, and more niche topics depending on what’s trending in the nonprofit world. Nonprofit Engage, run by Blackbaud, covers a number of organization formats including Nonprofits, Foundations, Healthcare, Arts & Cultural, Higher Education, K-12 Schools, Companies and Faith Communities. They’re also open to submissions from nonprofit experts. Nonprofit HR is the leader in human resource management for nonprofits, publishing yearly human resource statistics. Their site features a very comprehensive and well-designed blog focused on providing nonprofits with human resource advice through educational content. Nonprofit Hub is dedicated to helping nonprofits thrive. They offer a university-style online course to help understand crucial functions of nonprofits, while their blog focuses on general nonprofit advice on a variety of topics in the form of blog posts, podcasts, webinars and magazines. Nonprofit Law helps create and maintain legally compliant nonprofits through practical and affordable counseling. Their blog is filled with niche legal advice specifically for nonprofits. This includes topics such as legal traps, advocacy, boards, intellectual property, and much more. Nonprofit Marketing Guide is run by Kivi Miller, a leading author, trainer, and advisor to nonprofit marketing and fundraising professionals. The blog is written for do-it-yourself nonprofit marketers and one-person nonprofit communications departments by providing operational content such as overall strategies. Nonprofit Pro is known for their nonprofit management and strategy advice. Developed by thought leaders, the blog covers topics ranging from internal issues like human resources, to technology, legal advice and fundraising. With 80 categories to choose from, this blog is great for general advice. Nonprofit Quarterly focuses on recent news in the nonprofit space. Through their site, you can explore trending nonprofit news, daily updates and investigative reports as well as thought pieces on the state of nonprofits today. Nonprofit Talent helps nonprofits in the mid-Atlantic region recruit employees, board members, and interns. Their site allows for job posts viable to both employers and candidate directly in the nonprofit sector. Their blog often features profiles of nonprofit professionals talking about their jobs so that you can learn more about a variety of nonprofit professions. Nonprofit Tech for Good is a great source for nonprofit fundraising and social media advice. Their blog offers easy-to-understand information with fantastic downloadable content, news related to nonprofit technology, and fundraising strategies. NTEN is a membership organization of nonprofit technology professionals. Their blog covers how-tos, case studies and best practice articles on a range of technology topics, from accessibility and security to digital fundraising. Fundraising expert Pamela Grow’s blog is concise, easy to read, and gives great advice for fundraising and nonprofit marketing professionals alike. She publishes consistently on timely topics, and also has a webinar called Motivate Monday to inspire nonprofit professionals weekly. QGiv offers user-friendly, easy-to-use processing services for charitable donations, event registrations and pledges. If you're looking for all-encompassing donation content, give this blog a read. Their posts are well structured, easy to read, and contain valuable information on donations, pledges, and fundraising. Re: charity focuses primarily on making sure nonprofits have the information they need to make an educated decision about software. They have a variety of software reviews and comparisons as well as authoritative guides on a variety of fundraising and marketing topics. Salsa Labs is filled with nonprofit resources providing in-depth information on a range of topics from fundraising and advocacy to organizing and nonprofit technology. Their blog features a number of free guides available for download, which focus on areas such as advertising, campaigning, and fundraising. Socialbrite is an open platform on which anyone can contribute articles or posts on nonprofit topics. The majority of blog posts are from nonprofit experts sharing their insights and experiences from their work with charitable organizations such as Goodwill Industries, Habitat for Humanity, the Knight Foundation and TechSoup Global. Social Velocity is a management consulting firm helping nonprofits become more effective and sustainable at creating social change. Most blog posts talk about philanthropy and nonprofit leading advice, and feature fantastic content for becoming a better leader for your nonprofit or to develop your personal skills. Want to get more sponsors for your organization? Or improve your existing sponsorship program? Check out this blog run by sponsorship expert Chris Baylis, which covers everything to do with sponsorship no matter what stage your organization is at. The Stanford Social Innovation Review (SSIR) is an award-winning magazine and website that covers cross-sector solutions to global problems. SSIR is written by and for social change leaders from around the world and from all sectors of society. Their blog contains magazine snippets explored in depth, e-books, and paid subscription services. TechSoup helps nonprofits by providing discounted technology. Their blog focuses on helping nonprofits implement technology including software and hardware with content outlining a large number of strategies to help grow your nonprofit sustainably. Stay up to date on nonprofit news or dive into philanthropy as a whole. The Chronicle of Philanthropy is one of the largest philanthropy-focused sites with a variety of free content to explore surrounding grants, webinars, jobs and more. Subscription to the site and access to several high-value posts requires payment, but the range of free content is extremely large, with in-depth posts featuring downloadable content and great advice from guest bloggers in the space. The Fundraising Authority is a complete nonprofit help site. Their purpose is strictly to help nonprofits of any size improve their fundraising strategies through blog posts, webinars, podcasts, e-books, and other downloadable content. The Nonprofit Times features breaking news in the nonprofit space and provides a number of in-depth industry reports for paying users. Their site offers educational content in forms of blog posts, webinars, podcasts and whitepapers. If you're a visual learner, give this blog a try. Run by Vanessa Chase Lockshin, a nonprofit expert, this blog features shorter posts, many of which are accompanied by informative videos, often told in story format. Vanessa's experience provides useful industry insights even other experts can benefit from. The Third Sector brings readers charity fundraising news, which features in-depth reporting and best practices on a variety of fundraising topics. It’s UK-focused, but their content can still help nonprofits in any location. Top Nonprofits’ blog and resources focus on learning from the best in nonprofit management, fundraising, marketing, and technology. By hosting a number of industry professionals, this blog offers great industry insights through webinars, podcasts, whitepapers and blog posts. Twenty Hats is run by Eliza Kosarin, volunteer management consultant and expert, and features advice on everything volunteer-related. From training to tracking to motivation, this blog has it all. VolunteerHub's blog is filled with tips and tricks on managing and engaging volunteers starting from recruitment all the way to gratitude. Filled with downloadable content, this is a one-stop-shop for your nonprofit’s volunteer-related needs. WholeWhale is a tool to track frequent visitors on your site using Google Analytics. Their blog focuses on technology integration with nonprofits, and is very well organized, making it easy to find in-depth technological advice for your nonprofit. Since you’re already here, we figured we’d add ourselves to the list! We write about all kinds of topics that are of interest to nonprofits, associations, clubs and other small membership organizations, and aim to be the ultimate resource on growing your membership. Know of another nonprofit blog producing great content? Comment below to get it added to the list! Surprised you left out Joan Garry (www.joangarry.com). Maureen Wallbeoff's blog has also gotten pretty interesting for what she calls "accidental nonprofit techies" (www.meetmaureen.com). This is Greg McRay, CEO of Foundation Group (#9!). Thanks so much for the unsolicited shout-out. We sincerely appreciate it. Keep up the good work helping the NPO community! Honored to make the list. I haven't connected yet with some of these blogs, so my reading list just got longer! Hey Scott, thanks for the recommendations! I'll check them out. Great list! You might also want to check out my blog: https://MichaelRosenSays.wordpress.com . I provide general fundraising tips, planned giving insights, book highlights, research reports, real-life examples, and more. Hi Jo La, thanks for reaching out! I've checked it out and it looks like a great resource. Hi there! I read your list with great interest. Actually checked out every site. I'm curious to know what evaluative measures you used in including these particular sites on this list. Thank you. Hi Monique, I'm glad you enjoyed the post! We selected these blogs based on breadth and depth of information conveyed — basically, how valuable each blog was. We also looked at Domain Authority to see how many other sites currently link to that blog. I hope this helps!